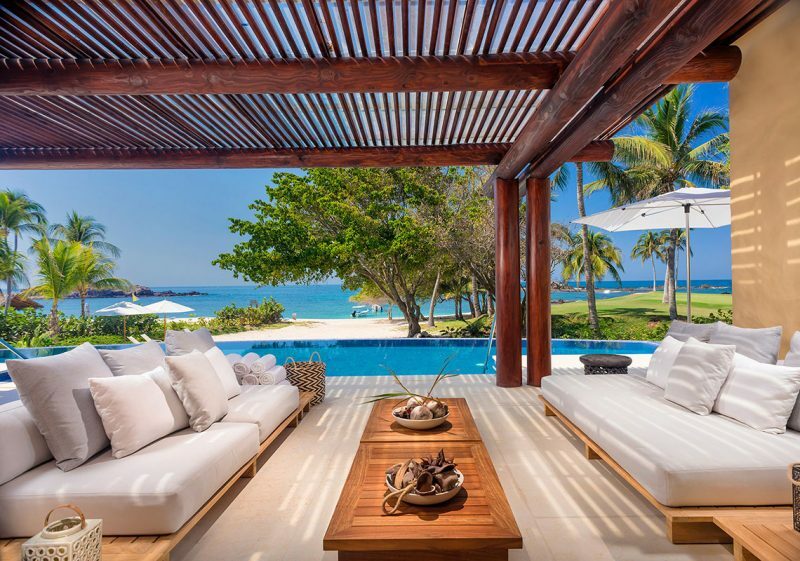 Villa Pacifico – one of the most exceptional white sandy beach front villas in Punta Mita is now for sale. Nestled on the pristine St. Regis cove, between the famous Pacifico Hole #18 green and the St. Regis Sea Breeze Beach Club, Villa Pacifico was initially designed to be a super four-bedroom residential suite for the adjacent resort. Delivered in 2015, DINE, Punta Mita´s master developer, used the villa to rent to high end vacationers, and top prospects to aid in selling the Pacifico Estate home sites, located just up the fairway. With the home sites nearly sold out, DINE, has decided to list this jewel of a property for sale. Designed by the DINE architectural team with influence from the traditional hacienda, broad beam, and clay tile design of the St. Regis Punta Mita Resort, the sloping site was re-contoured to maximize the spectacular Pacific Ocean views. The upstairs includes the gymnasium with one of the most spectacular views on the peninsula, and a spacious grand master bedroom with panoramic ocean views, generous in-suite St. Regis style bathroom, with a large walk-in closet. The entry level opens to an elegant family room that expands out onto the resort style outdoor terrace with an infinity pool, hot tub, outdoor kitchen, and wet bar. There are two beautifully appointed ocean view suites and one garden view suite with a closet and an in-suite bathroom. The villas have project plans allowing for an additional 2 bedrooms to be added, which could turn this 4-bedroom villa into a 6-bedroom villa – either way it is perfect for intimate or extravagant entertaining and only steps away from the luxurious lifestyle that Punta Mita and St. Regis Resort have to offer.